7th Bn, The East Surrey Regiment, 37th Brigade, 12th Division, B.E.F. Next of Kin: Son of Fanny E S Holden of St Albany’s Golf Common, Malvern and the late William Holden. Robert Edwin Holden was the third son of the late William Holden and of Mrs Holden of St Albans, Malvern Common. For some time he was in the employ of Mr F Russell Bishop of Rockliffe, Great Malvern and afterwards was with Mr Ferucie as a dental mechanic. He enlisted in the East Surrey Regiment at Mill Hill, Middlesex on the 23rd March 1915. At this time he lived at Northwood, Middlesex. He went to France the following July with the 7th Battalion. 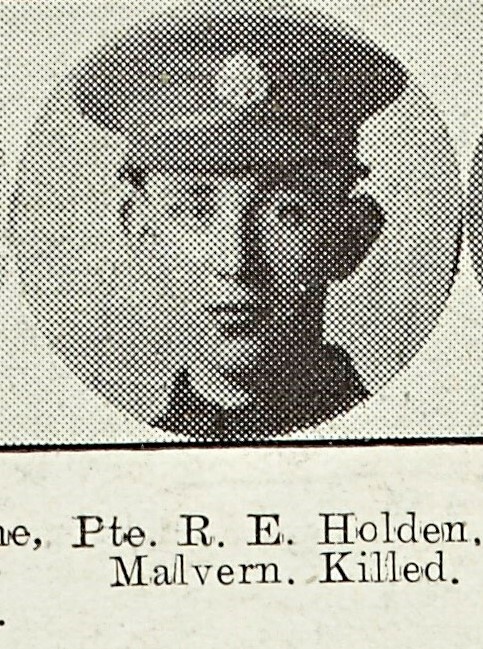 Private Holden was killed in action on the 9th August 1917, aged 20 and 8 months. The late Mr William Holden (his father) was for many years a GWR passenger guard on the lines between Malvern, Gloucester, Cheltenham, and Hereford – he died on the 9th December 1915. Despite being buried on the battlefield, Robert Holden’s grave was lost, probably as a result of later fighting and he is commemorated on the Arras Memorial.